Being with my children is always a special pleasure and privilege. They all have incredibly busy lives but they somehow manage to find time for me - not as an extra pair of hands (although this has sometimes happened in the past!) but more as a friend with whom to toss ideas around, to give and receive advice, to check up on, and to love. And so it has been in Singapore this time after yet another very long flight of 13 hours from Heathrow. Arriving at Changi Airport I made my first port of call a telephone booth to ask for help from a lovely technical man with removing my UK SIM card and replacing it with my NZ one. (Getting the back off my phone is a matter of sticking a pin into the top of the phone and I didn't have a pin small enough so hadn't been able to do it on the plane!) Fortunately he completed the task quickly and efficiently. He also directed me to the taxi stand and I made my way in that direction as I walked, checking my WhatsApp messages. And it was just as well I did because there were several messages from Adam, firstly to say that he was on his way to the airport, then to tell me where to wait and finally to give me his ETA. It was as I read this final message that I heard his voice and turned round to see him striding towards me! What a welcome, and surprising, sight. I had thought I would find Cam at their home with his delightful Filipino nanny, Marg, who would be looking after him until either one of them got home from work. She fits seamlessly into their lives - there when they can't be, and fading away when they are home. She talks to Cameron entirely in Tagalog, the language of about a quarter of the population of the Philippines, and he appears to understand every word she says even though he answers in English with an occasional word or two in Tagalog. They have long conversations in the two languages which leave me spellbound! Adam and Jan know that Tagalog might not be a useful language for him to use in the future. They are just happy that he's making good use of his brain! In fact, Marg wasn't there on this occasion. 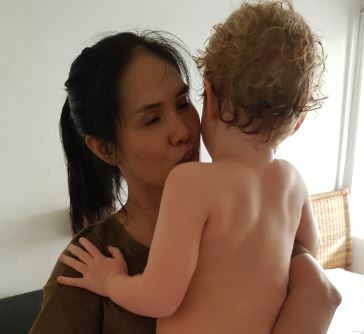 Jan had come home early and she and Cameron were waiting at their home, very close to the Tiong Bahru Market, and what a welcome! One little bombshell came flying towards me, squealing with delight! I had wondered if he would remember me as we had enjoyed only a few days together at Christmas with the whole family enjoying my early 75th birthday party! But remember me he did, and I soon became the focal point for his attention for the next three days! I liken him at the moment to a fire extinguisher on full throttle. He talks nineteen to the dozen and absorbs new information like a sponge. He's a complete joy. The following day, after a lovely meal and an early night, Adam told me the exciting news that 1 August is a holiday in Switzerland and that, as he works for Credit Suisse in Zurich, he was on holiday! 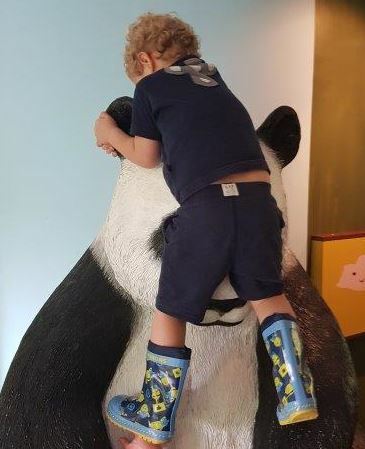 He had three options for how we might spend the day and I chose a visit to River Safari, one of the several Singapore Zoos at which the family have a season ticket. 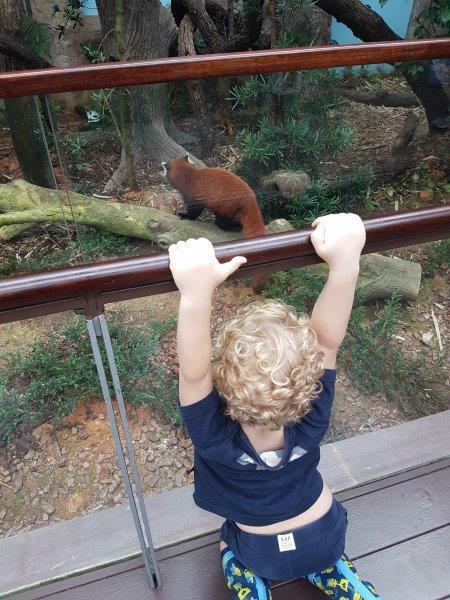 When Adam is in Singapore for about ten days each month, he takes Cameron to one or other of these zoos every morning so Cam knew it well and was soon instructing me on some of the animals, mammals and fish with which I wasn't well acquainted - like the Red Panda. 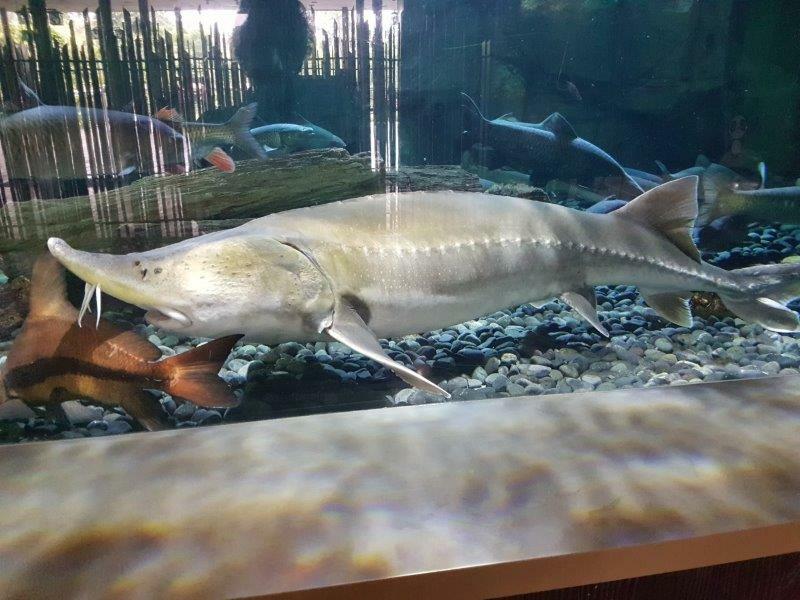 Cam explained to me that Sturgeon, which I'd never seen, are as old as dinosaurs. Instead of scales, they are covered with bony plates (called scutes) and can live for more than a hundred years. I checked up on this later and found that he was absolutely right! Their evolution dates back to the Triassic period, some 245 to 208 million years ago. I'd always known that several species of sturgeon are harvested for their roe which is processed into caviar and the reason why caviar-producing sturgeons are among the most valuable of all wildlife resources. But I'd never seen one. 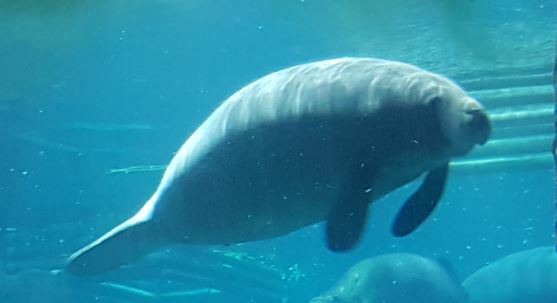 The mammal that I loved the best was the manatee or sea-cow. I understand that a good-sized West Indian manatee, the largest living plant-eating mammal, can weigh well over a ton. In other circumstances, I could have found a chair and sat on front of this tank and watched the manatees for hours! They move so slowly and gently and their complete appearance of peace and lack of pace was very calming. Quite often they would drift past the front of the tank and do a gentle roll - so slowly and peacefully that it was hard to see any effort being expended at all. One of the things that Cam enjoyed was watching the Stingrays being fed. 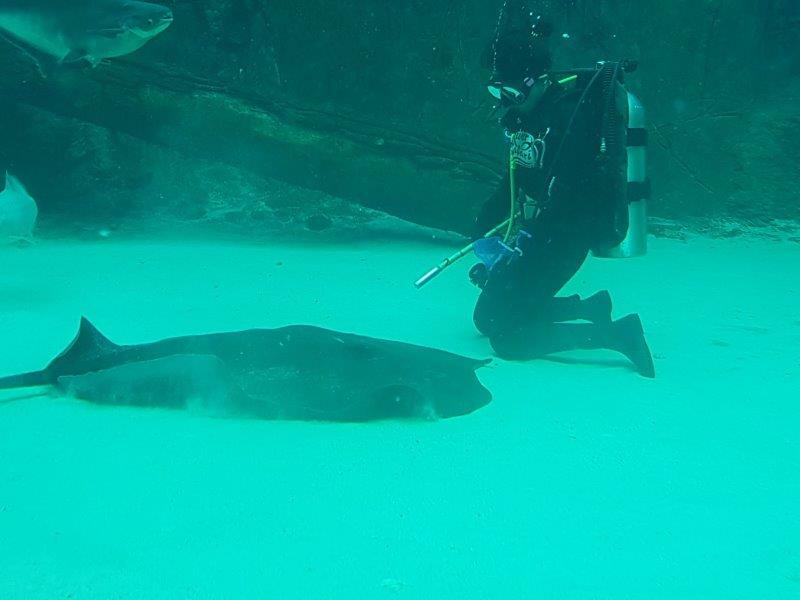 Divers go underwater with bags of bits of fish and encourage the Stingrays to come towards them by gently knocking a stick on the ground. Once a Stingray came close enough, it lifted its body up and the diver put her hand under the body to find the mouth and provide some fish. I found it fascinating to watch. 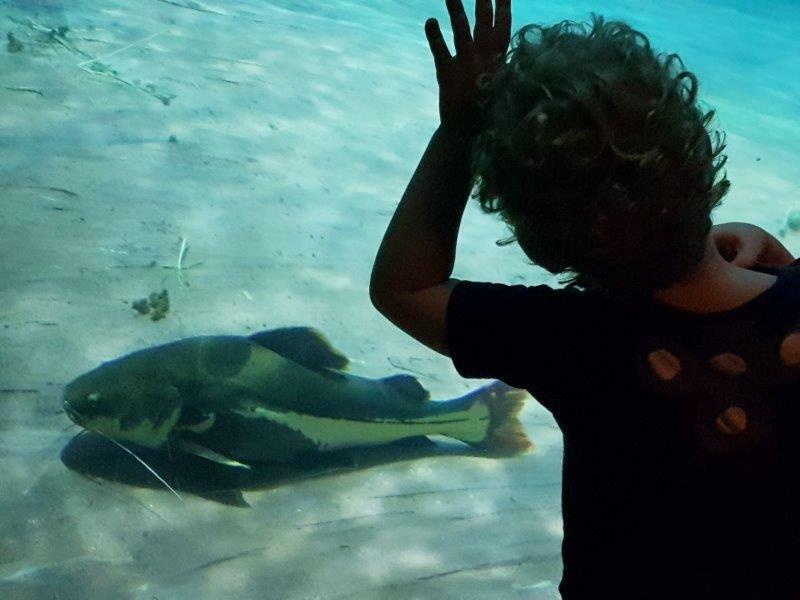 Another absorbing exhibit was the one containing catfish, possibly because of their whiskers which Cam soon discovered are actually called barbels. He knew that they should be on the floor of the tank because most catfish are bottom feeders - negatively buoyant - meaning that they will usually sink rather than float. He was like this at every exhibit - totally entranced and absorbed with every movement. At one exhibit he asked me if I knew what a tall tree-like post was and I suggested that it was just that - a post! 'No Grammy', he informed me patiently, 'that's a hydrothermal vent'! And sure enough, on closer inspection, I could see the tiny bubbles coming out of the top! 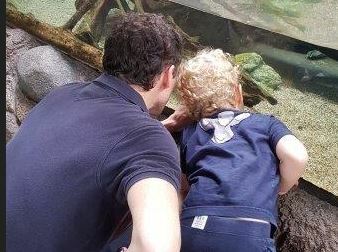 Sometimes Cam had to enlist the help of his Dad when he couldn't locate a particular fish or animal that he knew, from previous visits, should be visible! And sometimes he transformed from a walking encyclodaedia into a small boy who wants to conquer everything that can be climbed, or catch anything that can be chased. By the time we reached home for his afternoon nap, I think his Grammy was every bit as exhausted as he was! 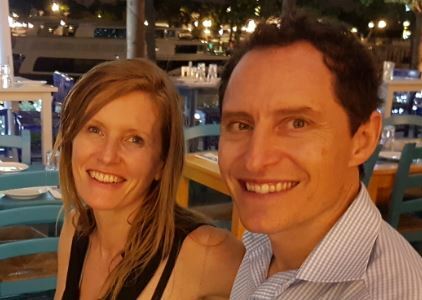 It was a lovely three days of family time, including our visit to a restaurant in Sentosa Cove on my last evening in Singapore, where we enjoyed a lovely early dinner in the balmy evening air while Cameron found several playmates and raced around beside the marina. The next day it was, inevitably, time to leave. This time away from New Zealand this year has been so full of re-connections and delights, but also full of goodbyes. Jan drove Cam and me to the British Club where they often spend Friday evenings with several of their friends with children, who are members. 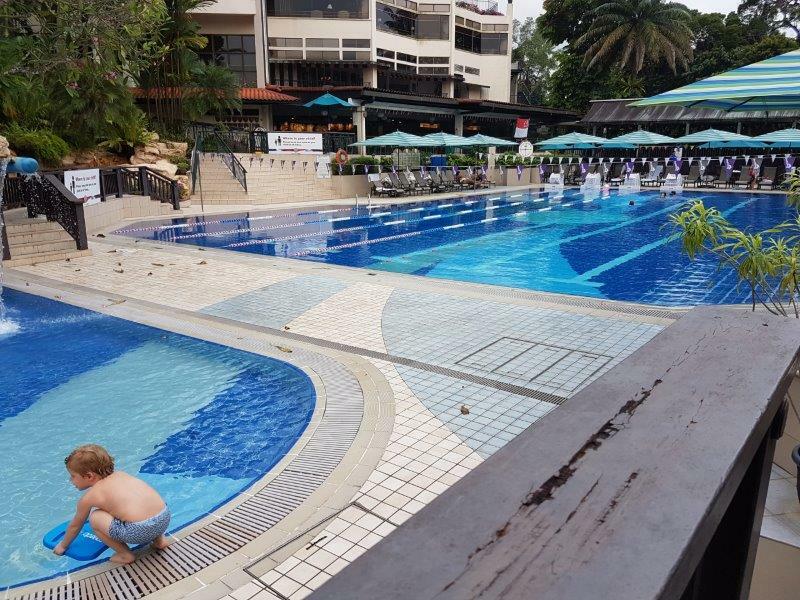 Adam soon joined us and the children enjoyed the beautiful pool and plenty of activity. I left them there and caught a taxi to the airport for my journey to Sydney. They both work so hard that it was great to see them relaxing and enjoying the atmosphere and companionship. Original generation time 1.2568 seconds. Cache Loaded in: 0.0330 seconds.